Yes! Each one of us is given different gifts, but part of our growth in faith is to discern the best way to love God and one another through our vocation. A vocation is more than a career, it’s a call from God. Many are called to marriage, and perhaps to be parents. Others are called to the permanant deaconate. But some are called to give their whole lives for the mission of the Church through priesthood and religious life. Do I have to be a priest or religious to serve the Church well? 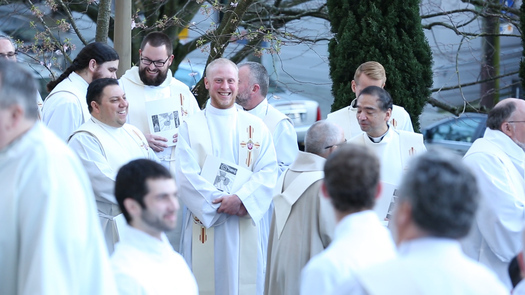 No, the church in the Archdiocese of Seattle, the local Church in Western WA, needs people of every vocation who will be ministers with their entire lives. Some are called to priesthood and religious life, some to a life of marriage and/or professional work in secular fields, and others are called to careers within the Church, either ordained or lay. The Church needs all vocations to minister to it's people. God is calling you! Bring that calling and discernment to the Church. None of us discern alone. If you feel a calling to priesthood, religious life or marriage, have the courage to say yes and take the next step – Trusting that the Risen Jesus will be with you and God has in store for you a future full of hope.